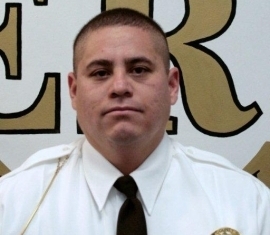 Sergeant Franco R. Aguilar died instantly as the result of a fall from a freeway overpass. The 36-year-old victim had responded to the scene of a one-car traffic crash atop the Fish Creek overpass on Interstate 70, approximately 12 miles east of Interstate 15. While Sgt. Franco was investigating the incident, the driver of an approaching vehicle lost control on the icy road due to excessive speed. He collided with the first vehicle. Sgt. Aguilar was knocked from the overpass and fell 250 feet to his death. He is survived by his wife and five children. In 2011, the driver who struck the stopped vehicles pled guilty to a charge of negligent homicide. Sgt. Augilar’s bronze memorial plaque is sponsored by the Bureau of Indian Affairs, Fort Duchesne. He was a good man and will be missed! A true hero! Franco was a great cop. He was always friendly, considerate and smiling! RIP Franco Aguilar, a great friend and brother….. Viviras siempre en nuestro corazon… you will be missed by every one that got the honor to know you. No doubt you are guarding heaven’s gates, forver on duty brother! Semper Fidelis Marine! May there be mercy from the pain and suffering your family is going through.